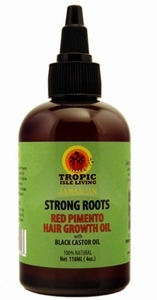 STRONG ROOTS Red Pimento Hair Growth Oil strengthens, thickens and grows your hair. It increases blood flow to the scalp, supplies valuable nutrients to hair roots, stimulates hair follicles, strengthens hair shaft and help to remove toxins and parasites that could retard hair growth. 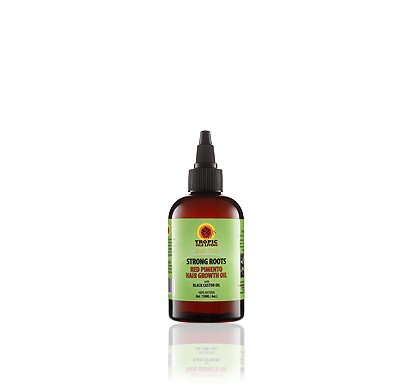 Red pimento oil contains appreciable levels of the trace mineral, copper, which is beneficial to the hair in many ways. - Recommended amount of use is every 2-3 days for natural hair and 1-2 times a week for permed or texturized hair. - For fine and oily hair types we recommend you use this product as a hot oil treatment before showering to avoid build up. A proprietary blend of Jamaican Red Pimento Oil, Jamaican Black Castor Oil, Wheat germ, and Organic Coconut oil.